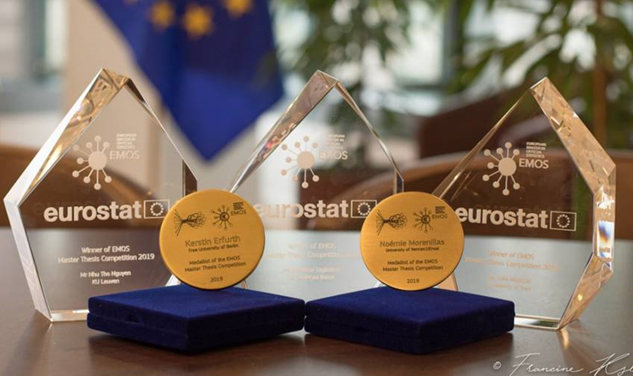 The Master thesis competition for EMOS graduates was organised for the first time to highlight official statistics as a research topic and put forward young talents with innovative contributions. The Board had the difficult task to select five authors to feature their thesis in the New Techniques and Technologies for Statistics (NTTS) Conference with travel and accommodation covered by Eurostat. The NTTS conference, with some 800 participants this year, is one of the world’s largest official statistics research conference series..
University of Pisa took the opportunity of attending for the first time the Big Data Hackathon challenge. BD Hackathon winners came from statistical offices of Poland, Italy and the UK, but the youngest team amongst 17 teams of 51 full blooded professional statisticians proved creative and resilient. 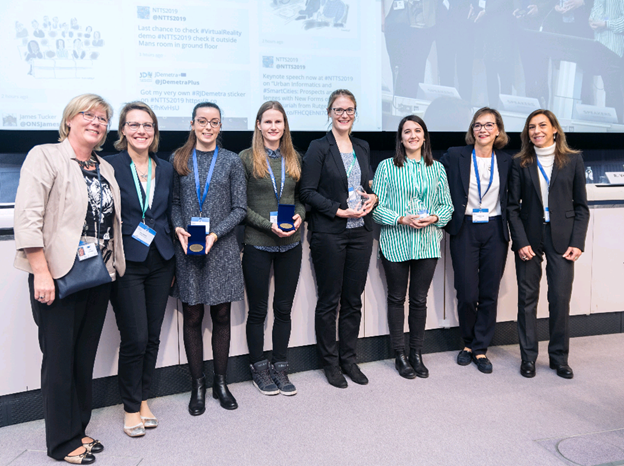 From left to right Heli Lehtimäki (Eurostat,EMOS secretariat), Mojca Bavdaz (EMOS Board member and discussant, University of Ljubljana), Noémie Morenillas (winner,Rennes), Kerstin Erfurth (winner,Berlin), Julia Manecke (winner,Trier), Giovanna Tagliaferri (winner,La Sapienza), Annika Näslund (Eurostat, Chair of EMOS Board) and Rosanna Verde (University of Campania, discussant) *missing from picture: winner Nhu Tho Ngyen ( KU Leuven). EMOS is a label awarded by the European Statistical System Committee (ESSC) for four years to nationally accredited Master programmes which are in line with the EMOS learning outcomes, aiming at familiarising the graduates with the system of official statistics, production models, statistical methods and dissemination. 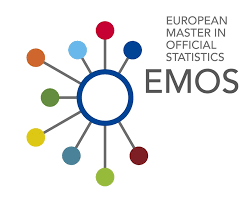 EMOS-labelled Master programmes also collaborate actively with the National Statistical Institutes or other producers of official statistics for relevant master thesis topics and internships in the sphere of official statistics.